Every year, about 250,000 men will be diagnosed with prostate cancer in the U.S. After skin cancer, prostate cancer is the most common cancer diagnosed in American men. Every American man has a one in six chance of being diagnosed with prostate cancer sometime in his lifetime, and almost 30,000 men will die from prostate cancer. The good news is that the majority of men diagnosed with prostate cancer will survive (there are about 2.5 million men living in the U.S. who have once been diagnosed with prostate cancer, and current statistics show that only three percent of men diagnosed with prostate cancer die from it). Nevertheless, to avoid the pain and possible fatality of this disease, scientists have recommended—and doctors have encouraged—getting screened for prostate cancer with a prostate-specific antigen (PSA) test or a digital rectal exam (DRE). But can screening do more harm than good? That’s why the American College of Physicians examined current screening guidelines, set forth by a variety of different organizations, to uncover if the benefits of screening outweigh the risks. After reviewing the evidence, their final recommendation is that some men don’t need to be screened—and for others, you need to carefully consider it. If you don’t have specific risk factors for prostate cancer, and if you fall into any of those categories, you don’t need to get screened, unless you have a preference for doing so, according to the American College of Physicians. After conducting a literature review, they found no benefit of annual screening, and that, according to current research, one screening every four years might be more appropriate. One of the main problems that the researchers pointed out is that once men are screened for prostate cancer, they may be encouraged to get a prostatectomy or radiotherapy—two serious lines of treatment that can create even more harm. Of course, in some men, it may be necessary, but the point is that doctors may not want to take the risk of keeping a close eye on your illness, and will instead opt for a quick and easy surgery. If that surgery is unnecessary, this puts your health at risk. Oftentimes, you might feel like your doctor knows best—so you just take their word for it when they say you need to be screened or tested for a certain disease. But these new screening guidelines are geared to help physicians understand that they must explain the full benefits and negative effects of prostate cancer screening to their patients. Studies show that one in three men don’t even know they were screened for prostate cancer with a PSA or DRE and the majority state they didn’t know what the negative effects and benefits were. That’s why it’s important to communicate with your physician—and do the research—to determine if the benefits outweigh the risks for you. 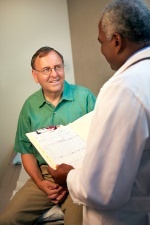 “What are the key statistics about prostate cancer?” American Cancer Society web site, February 27, 2012; http://www.cancer.org/cancer/prostatecancer/detailedguide/prostate-cancer-key-statistics, last accessed April 11, 2013. Qaseem, A., et al., “Screening for Prostate Cancer: A Guidance Statement From the Clinical Guidelines Committee of the American College of Physicians,” Annals of Internal Medicine April 9, 2013.